A generous friend gave me some ground moose! Thanks, Marj. I decided to make something with it and share it with her. I decided to experiment with making German Bologna with moose. It is normally made with a combination of pork and beef but I tried pork and moose. I have put beef in the recipe because not everyone has a friend who gives them moose. I actually made two sausages in this cook, German Bologna and Mettwurst. I will post the Mettwurst later. I started by putting some fibrous casings in warm water to soak. Fibrous casings are often referred to as FB casings. 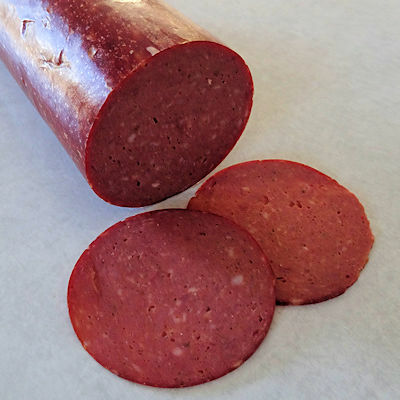 They are a casing used in making salami, summer sausage and other large diameter sausages. They allow smoke to make its way through the casing and flavour the meat. It is not edible and needs to be peeled off the sausage before serving. It should also be soaked in hot water for an hour before use so it is pliable. 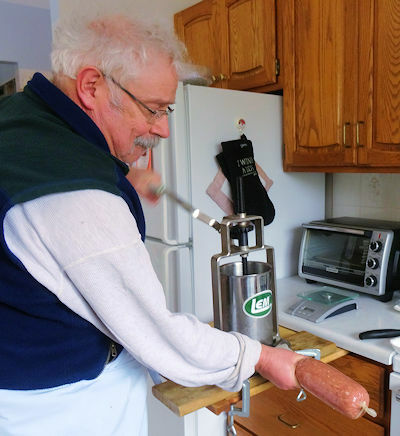 A 20 inch by 2 1/2 inch diameter FB casing holds 3 pounds of sausage so I needed one for the German Bologna. I had about 700 grams (1 1/2 pounds) of moose and cubed the same amount of fatty pork shoulder. I put the meat in the freezer for 20 minutes. Meat grinds better and you get a better consistency in your sausage if you keep the meat cold. I ground the pork cubes through the fine plate on the grinder attachment of my stand mixer. Then I ran the pork and moose through the grinder again, alternating portions of pork and moose. I put the ground meat in the freezer for 20 minutes. If you have never heard of Prague Powder #1 it is a curing salt. It can come under other names, InstaCure #1, Pink Salt #1 and more. You are looking for a curing salt that is 93.75 % salt and 6.25 % sodium nitrite. This inhibits bacterial growth through the slow smoking and cooking process. It also give the nice red colour to the sausage. Do not use more or less. Too little will allow the sausage to spoil and too much is bad for you. I put 1/2 of the slurry and 1/2 of the meat in the bowl of my stand mixer. I put the mixing paddle on and started on low until mixed and then mixed at medium high for 3 minutes. I took the mixture out and repeated the procedure with the remaining meat and slurry. Then I mixed both batches together by hand. I used my dedicated sausage stuffer to stuff the FB casing. If your stand mixer has a sausage stuffing attachment, don’t use it. Every time I tried it was a horrible experience. I tied the open end of the casing off and put the sausage in the fridge overnight. This allows the seasoning and cure to even out in the sausage. The next day, I used my A-Maze-N pellet smoker to cold smoke the sausage for 4 hours. You can use a smoker to cook the sausage but it takes a low starting temperature and gradual heat increases to cook the sausage. If you cook it too quickly, the fat will render out and give a poor result. So, if your smoker will operate at 140 to 150 F, feel free to put it in the smoker without cold smoking it. Mine doesn’t go that low so I cold smoked it first. Put the sausage in a smoker or oven at 140 to 150 F. Cook for one hour. Increase the temperature by 5 F every 1/2 hour until the smoker or oven is at 180 F.
If your oven or smoker won’t go that low, put them in at the lowest temperature it cooks at, so long as it is not over 180 F. Then cook for one hour and increase to 180 F. I have even done the whole cook at 180 F.
Also, if you don’t have a smoker, you can just cook this in the oven for a fine sausage. It just won’t have that kiss of smoke. What I did was the cold smoke for 4 hours and then put in at 145 F, cooked for an hour and slowly increased to 180 F every 1/2 hour. It took about 8 hours to cook to an internal temperature of 155 F when it is done. After the sausage reaches an internal temperature of 155 F, take it out and plunge it in an ice water bath for 10 minutes. Take it out and let it hang for 2 hours and then refrigerate overnight. The next day, you are ready to slice it up! This is way better than any Bologna you have had before. There is a greater depth of flavour from the spices. The texture isn’t as rubbery. With beef, it has a nicely spiced tender meat flavour. With the moose, it has a touch of game taste I really liked. Have a great Bologna sandwich, try this! Soak the fibrous casing in warm water for an hour. Put the meat in the freezer for 20 minutes. Grind the pork through a fine plate on a grinder. Run beef and pork through the fine plate again. Make a slurry by mixing the remaining ingredients. Put 1/2 of the meat and slurry in the bowl of a stand mixer with the paddle attachment. Mix slowly until combined and then beat at medium high speed for 3 minutes. Mix the second 1/2 of the meat and slurry the same way. Mix the two batches together. Stuff into the casing and tie off the open end. Cold smoke for 4 hours. Put the sausage in an oven at 140 to 150 F (you can cook at 180 F for the whole cook but will have a tougher texture). Cook for 1 hour. Increase the temperature by 5 F every half hour until the oven reaches 180 F.
Cook until the internal temperature of the sausage is 155 F, seven to eight hours. Plunge into an ice water bath for 10 minutes. Put in the fridge overnight before serving. How lucky for you both!